Deatails Alabama shortly following the Trail of Tears and the Indian Removal Act. A Diagram of the State of Alabama. 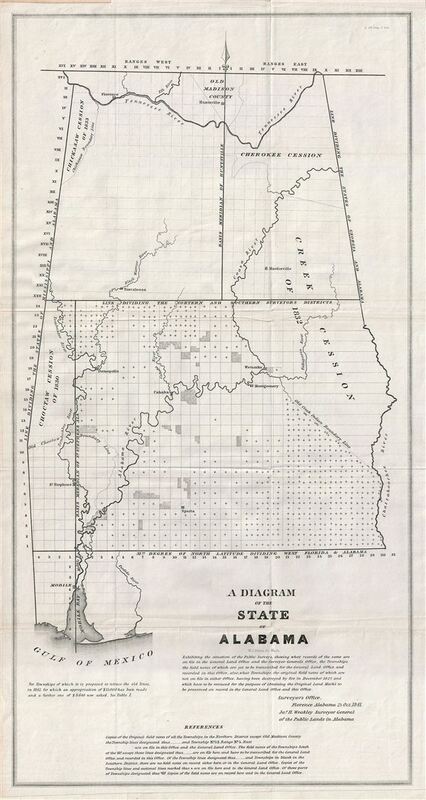 This is a fine example of the 1841 public survey map of the Alabama, representing the work of the Alabama Land Survey as of October 1841. The map covers the entire state of Alabama from Old Madison County to the Gulf of Mexico and includes the state boundary line between Mississippi and Alabama in the west and Georgia and Alabama in the east. Following shortly on the events associated with the Trail of Tears and the Indian Removal Act in the late 1830s, this map identifies the seized American Indian lands, referring to them as the Cherokee Cession, the Choctaw Cession of 1830, the Chickasaw Cession of 1833 and the Creek Cession on 1832. Various rivers and cities are also identified, including Florence, Huntsville, Sparta, Wetumka, among others. This map was created under the supervision of James H. Weakley, Surveyor General of the Public Lands in Alabama on October 25, 1841. It is noteworthy that these maps commonly appear in very poor condition due to low production quality, yet the present example is near pristine. If you are considering adding this significant map to your collection, this is the one you want. Senate Doc. 61, 26th , 2nd Session, (Washington), 1841. Very good. Original fold lines visible. Near pristine condition, paper exhibits little wear or age damage and almost no toning - the cleanest public survey map we have seen.